For anyone unfamiliar with the site always check the FRESHWATER, SALTWATER and TACK-TICS pages. The Saltwater page now extends back as a record of over four years of (mostly) sea fishing and may be a useful guide as to when to fish. The Freshwater stuff is also up to date now. I keep adding to both. These pages are effectively my diary and the latest will usually be about fishing in the previous day or two. The Tactics pages which are chiefly 'how I do it' plus a bit of science are also updated regularly and (I think) worth a read (the earlier ones are mostly tackle and 'how to do it' stuff). Recently I made three successive trips to the same spot at two day intervals. Each time I fished through first light, for about an hour, using the same popper - a large 'Duel Magnet Slider'. On the first trip I had six bites, hooked three of them and landed three bass. Of course this encouraged me to have another go and two days later I was down there again. The tide was a bit later so I couldn't get out to fish the main ledge (I have to wade to it in chest waders) but I gave it a good try. No bites until, after about half-an-hour, I cast through a gap in the main ledge. At this stage the tide was pouring through the gap (away from me) and I simply chugged the lure back through the torrent towards me. 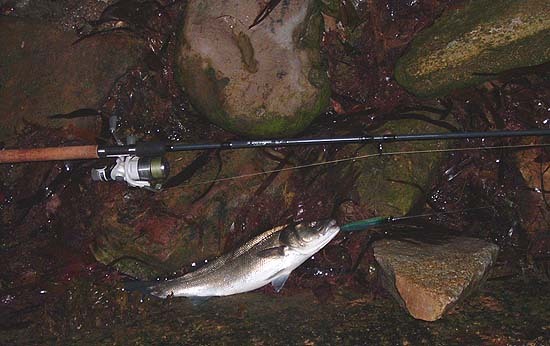 Just as the popper reached the most turbulent spot, a few centimetres 'downstream' of the ledge it was taken by a fish that had obviously been waiting for baitfish swept through the gap by the current. I landed the fish, took its picture and returned it. Two days later I tried exactly the same thing again. Dawn, popper etc. etc. Not a sniff. This time the tide was hardly flowing through the ledge and there was little water movement. 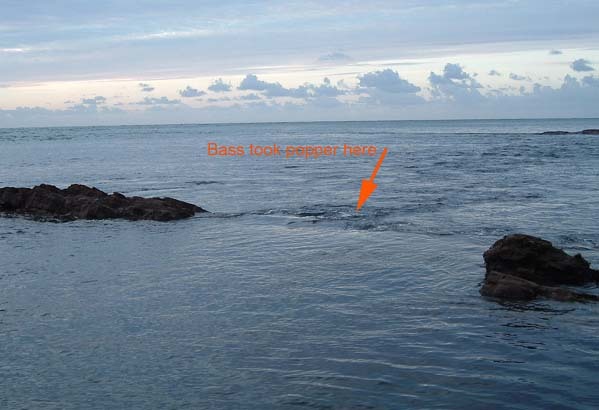 It looks as though the progressive change in tidal flow was associated with a reduction in my chance of catching bass. Possibly the fish moved away or perhaps they were less keen to feed in the slacker water. I find these sequences of trips to the same spot, at the same time, under similar conditions, doing the same thing VERY informative. In fact I'd go so far as to say that it is the most important approach to learning where when and how to predict results. 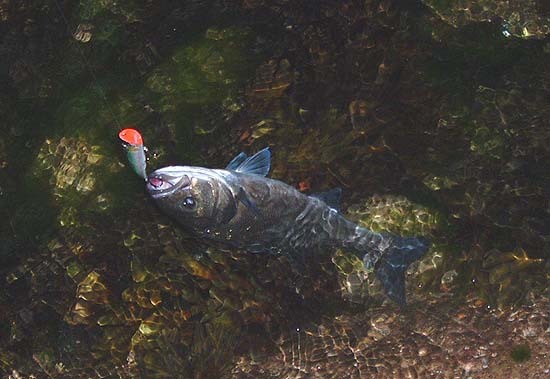 Random sessions at different spots, however successful they may be are much less useful in establishing the patterns so vital to consistent catches.